eCourses web portal is designed to assist both students and professors in basic engineering courses. The web site includes all instructional material to conduct a course and there is no cost to either the instructor or student. Features include eBook, database of homework/quiz/test problems, solutions to all problems, lectures in both Quicktime and Flash format, computer grading, and utilities. To help facilitate communications between students, instructors, and TAs there is an integrate web board and collaborative drawing board. Each web-based course is controlled and administered by the instructor. 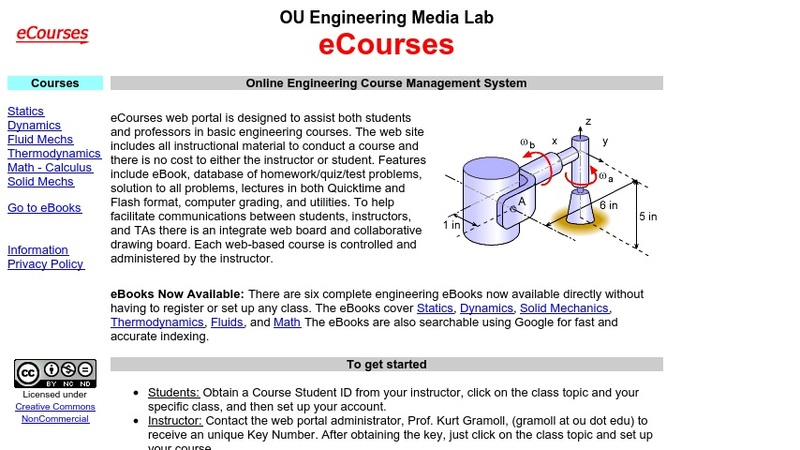 There are six complete engineering eBooks available directly without having to register or set up any class. The eBooks cover Statics, Dynamics, Thermodynamics, Fluids, Math, and Multimedia. The eBooks are also searchable using a Google-Mini for fast and accurate indexing.